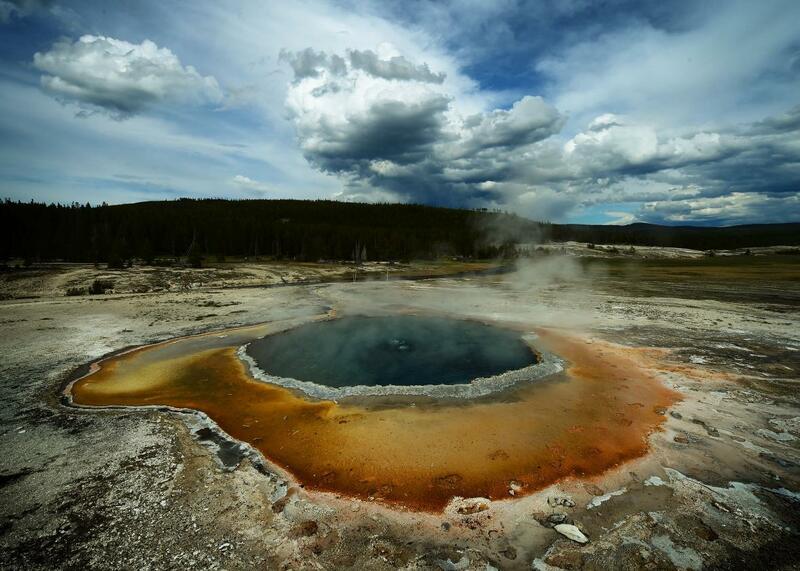 Fears of a Yellowstone supervolcano eruption are baseless. People Are Freaking Out About the Yellowstone Supervolcano. Again. One of the geothermal hot springs in Yellowstone National Park. You know what's going to explode sooner than Yellowstone? My head. Recent evidence suggests eruptions may develop quickly on a geological timescale, but in human years, that’s still as slow as molasses. While it’s certainly possible the next gargantuan gurgle could happen in the next few decades, it also could be centuries off. Even if the not-so-super volcano did erupt, it certainly wouldn’t end life on Earth, it’d just make living a lot harder. Yellowstone would likely be filled with magma and the rest of the continent would suffer airport shutdowns and potentially tainted crops and water, but we’d all be alive. But this hasn’t stopped people from freaking out—and, in some dark circles of the internet, fawning over—North America’s crusty pustule. At this point in time, we are much more likely to be consumed in a wildfire or submerged in poopy floodwaters during this unusually active hurricane season than we are to witness all life on Earth consumed by a red river of magma. But the persistent fear of the supervolcano has erupted again, and again, and again. At this point, it’s not worth debunking. Rather, it’s time to ask: What fiery caldera did these myths even emerge from? 2002: From there, the notion of a supervolcano was picked up and spread about by R.B. Trombley, head of the “International Volcano Research Centre.” The name sounds grand, but it was actually headquartered in a trailer. Trombley claimed he could predict the next eruption of the Yellowstone supervolcano using his special earthquake-prediction software. According to Wired, in 2002 Trombley authored the “first truly geological publication focused on a ‘supervolcano that can be found in Google Scholar.” But “[v]olcanologists recognized in their field have questioned Trombley’s credentials and his methodology,” the Arizona Republic wrote in 2010. 2004: Finally, super-eruptions made their way into the mainstream academic literature associated with Yellowstone, via a 2004 report in the Bulletin of Volcanology. In this study, B.G. Mason and his co-authors assessed hotspots throughout history—and called out researchers who used the “qualitative, but highly evocative, terms ‘supereruption’ and ‘supervolcano’ ” in research on past volcanic eruptions. 2005: But the Yellowstone supervolcano really had its moment when the BBC and the Discovery Channel teamed up to air Supervolcano, a 2005 “factual drama” about a hypothetical future where Yellowstone erupts. “The beauty of America’s Yellowstone National Park masks one of the rarest and most destructive forces on Earth—a supervolcano,” the promotional material read. While there isn’t publicly available data about how many people watched the documentary, it’s clear it had an impact. Use of the word supervolcano has only continued to rise after the docudrama’s release, according to a 2013 Wired article on the etymology of the word. For a stylish graphical representation of this point, I give to you this Google N-Gram data. April 2014: When the biggest earthquake in more than two decades hit Yellowstone, reports of animals fleeing the supervolcano’s path proliferated online. But as Slate wrote at the time, this was far from the case. Animals, for one, don’t actually have spidey senses that allow them to run away from impending deep-earth doom. And, as we now know for certain, the supervolcano definitely didn’t erupt that un-fateful day in 2014. July 2017: Despite repeated false predictions, supervolcano fears have only heated up in 2017. In July, a 5.8-magnitude earthquake was recorded in western Montana, which butts up against the national park. The U.S. Geological Service later attributed the admittedly unusual seismic event to the natural slip-and-slide of faults—not a foreboding rumble of Yellowstone magma. September 2017: But the Montana earthquake hysteria was only compounded by the fact that Yellowstone later recorded an epic “earthquake swarm,” with more 2,300 low-magnitude tremors between June and August. Several outlets including Newsweek naturally capitalized on this event, writing about the geographic jitters. While a source is quoted as saying, literally, this is “nothing out of the ordinary,” our emotions were anything but. October 2017: We’ve come full circle and are back in Spooktober 2017. The latest quiver was stirred when researchers from Arizona State University presented new findings about Yellowstone’s caldera at a volcanology conference. (Disclosure: ASU is a partner with Slate and New America in Future Tense.) Essentially, the scientists found that past eruptions on the site happened more quickly than many thought possible. “As such, scientists are just now starting to realize that the conditions that lead to supereruptions might emerge within a human lifetime,” the New York Times reported. Clearly, that’s far from saying that such an event will occur in our human lifetime, yet supervolcano fears were stoked once again. Ultimately, a large-scale volcanic eruption wouldn’t be pretty. People would die and people would suffer, just as they did in the numerous earthquakes, hurricanes, and other natural disasters this year. But, at least for now, the Yellowstone “supervolcano” seems pretty regular—and its rumblings nothing to lose sleep over.